Ananka's Diary: Britain Invaded By Tarantulas! Here's the latest story. Two rare Chilean Rose tarantulas have recently been discovered in gardens in the north of England. The gardens in question are only two miles apart, and the spiders are the same age and breed, which has led some experts to suggest that the two probably aren't alone. Oh yeah, I almost forgot. The Chilean Rose tarantula spits hairs that can blind humans. Have a nice day! why don't they do something on the cowicas arachnidis? there the rarest thing on earth! The "Have a Nice Day" was especially helpful because I am currently in the UK... and will no longer be having one. True story here. Once upon a time we kids sent the parents out to a dinner party. They came back with a tarantula. It just followed them home. Yeah, like a spider would frive holes into a jar lid with a nail for the trip. Still, it was cool. Even though we nearly got fired by our veterinarian when we brought the spider in for advice. 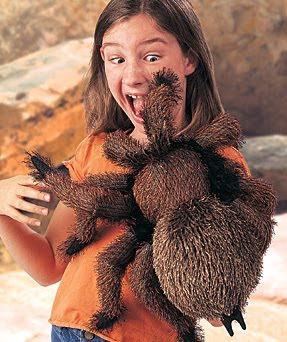 Decency forbids giving details, but Tara the Tarantula was a very messy eater. ooh, can you take a picture of your orange spider and post it? it would be fairly interesting.... how big is it? but since its not i bet it would be good for practical jokes. but now i want a purple goat. on the bright side, it'd be worse if the spiders were 47 feet tall and the poisonous hairs were as big as javelins. I don't mind seeing pictures of spiders, and think they're pretty cute, until I see a live one. Everybody!! I have great, amazing, wonderful news!!!!!!!!!!!!!!! LAURA DEKKER CAN SAIL!!!! The government finally cleared her to go on Tuesday!!!!!!!!!!!!!! WOOOOOOOOOOOOOO!!!!!! GO LAURA!!!!!!!!!!!!! !